According to the RCN official website the Canadian Navy fleet is roughly balanced between the Atlantic and Pacific coasts. (1) A quick look at the basic facts would appear to back up this assertion. Maritime Forces Pacific (MARPAC) is responsible for generating and maintaining multi-purpose, combat-capable maritime forces prepared to conduct operations in Canadian waters, and in support of national objectives anywhere in the world. Comprising 15 warships and several auxiliary vessels, the Pacific Fleet is responsible for Canada' Exclusive Economic Zone on the West Coast and Canada's Area of Responsibility in the Pacific Ocean and the western Arctic Ocean. The domestic area of responsibility covers 1.7 million square kilometers of ocean in the north eastern Pacific. The Commander of Maritime Forces Atlantic (MARLANT) is responsible to the Chief of the Maritime Staff in Ottawa for generating ships and sailors as well as command and control capabilities for Domestic and international missions. 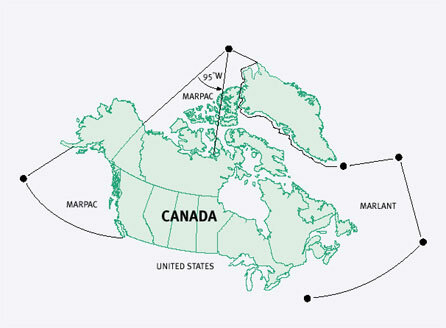 The Atlantic Fleet, with 18 warships and a number of auxiliary vessels, is responsible for Canada's Exclusive Economic Zone on the East Coast, as well as Canada's Area of Responsibility in the Atlantic Ocean and the eastern Arctic Ocean in an area covering more than 4.8 million square kilometers. What these basics do not reveal is that the Canadian Navy is heavily biased towards the Atlantic fleet. This bias is rooted at least as much in history as it is based on the larger area that the Atlantic command is responsible for. However, Canada’s requires more then the guarding of areas on a map for its security. One of the things a navy is for is to protect the trade that our prosperity relies on. What all this means is that trade in the Pacific is growing, will continue to grow and that more and more of Canada’s economy will be tied to Pacific region trade routes. Historically the RCN has fought its battles, both cold and hot, in the Atlantic and has always seen the Pacific fleet as a holding and training area. It is not an exaggeration to say that Command of the Atlantic fleet has always been seen as a much more important command then that of the Pacific Fleet. The Atlantic Fleet has always had the first pick of ships. The newest and most advanced have been routinely assigned to MARLANT. Even now, with three command and control destroyers available, two are in the Atlantic region. Of the twelve Halifax class frigates, seven are on the east coast and only five in the west. What this means is that of fifteen major warships in the RCN inventory, nine are in Halifax and only six in Esquimalt. This is not “balance”. It can be argued that Canadian participation in these exercises eclipses our interest in Atlantic oriented NATO exercises, and for good reason. If the twentieth century was the Atlantic century then the 21st seems poised to become a century in which the Pacific dominates world events. Canada, with its transcontinental nature, is well positioned to manage the transitions that these changes to a Pacific centric age will bring. Times of shrinking budgets can also be a good time to reassess priorities. This is the time to seriously consider the Pacific theatre as the center of gravity for Canadian security concerns. It will not be enough in the future to have a navy “roughly balanced” between east and west coasts. In fact the Pacific fleet should become the dominant arm of the RCN and budgets and capabilities should reflect this new reality.